Nickels Energy Solutions is proud to have been nominated and accepted into Solar Power World’s Top 500 Solar Contractors in the nation. The list of Top Solar Contractors comes out every year and this is the first year Nickels Energy Solutions has been included on this prestigious list. Solar Power World manages hundreds and hundreds of applications from all over the country, but only the best solar companies are added to this elite group! 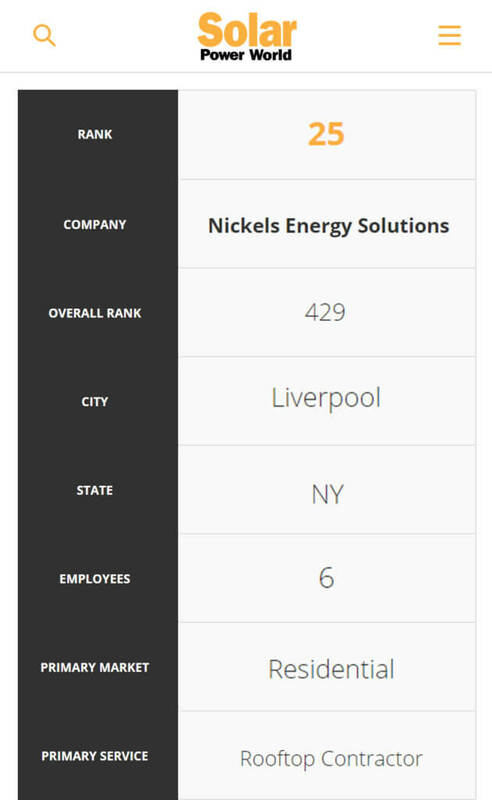 This year, Nickels Energy Solutions ranked in the Top 500 in the United States and in the Top 25 in New York state. Nickels Energy Solutions’ momentum continues to grow in 2018. With a strong team in place and more customers than ever before, the goal for Nickels Energy Solutions is to improve on their national and state rankings on next year’s list.